In 2011, the day before Montreal’s Zenda Group closed on a $29.5-million dollar deal to purchase the Bridgewater Mall and Eastside Plaza on Nova Scotia’s South Shore, Target’s purchase of Zellers leaseholds was announced. Zellers anchored 92,000 square feet in the 250,000-sq.-ft. development and there were no assurances Target would occupy the space once Zellers left. Another buyer might have pulled out of the deal. But Zenda – along with its partner Time Equities Inc. out of New York City – stuck with it and three years later it looks as if that decision is paying dividends for the real estate investment and management firm. As it turns out, Target never did move into the space, and as Michael Levy – Zenda Group’s vice-president of asset management – dryly notes, things are a little less exciting for Target these days. Zenda has spent roughly $8 million redeveloping the mall, carrying out a full retrofit of the old Zellers box plus the receiving area. Over the last few weeks, the new tenants have been moving into a space that now has three exterior store fronts, another two which face into the mall, and a multi-tenant loading dock with a major waste removal and receiving area. The tenants include Dollarama, which has expanded from another location in the mall; new comers SportChek, which is taking over 12,923 square feet; and Leon’s, which is occupying 30,842 sq. ft. Clothing retailer Mark’s is moving over from another Bridgewater power centre to take over 10,000 sq. ft., while a retailer Levy identified as “a junior department store owned by an American group,” is occupying the remaining 18,000 sq. ft.
People not familiar with Nova Scotia might wonder why the Bridgewater Mall would be worth the time and effort. But at a time when many rural locations are losing population, Bridgewater continues to expand, living up to its slogan of being the Main Street of the South Shore. The mall draws on a regional population of approximately 100,000. 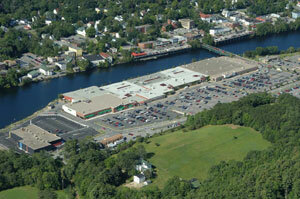 “We can turn this property into a powerhouse regional mall for the entire South Shore of the province,” Levy enthuses. As a company, Zenda is nearly 100 years old. Levy’s great grand-father had real estate holdings and developed multi-residential in Montreal. The firm is still a family affair, with Levy’s father, Gerald, in the position of president, and his brother, William, working as vice-president. The company name comes from the classic novel, The Prisoner of Zenda, although the exact reason for the origin now seems lost in time. Since Gerald took over in the 1990s, Zenda has indeed done well for itself, buying and selling real estate across Canada and into the U.S. Currently the firm has 10 properties, a mix of office, retail and industrial spread over Texas, California, Nova Scotia and Newfoundland & Labrador.